Whether you are a complete beginner or want to hone your skills, we have a sewing class to suit you. My classes are fun and stress-free and include materials and refreshments. For all-day classes, an optional €10 ‘meal deal’ is available for a light fixed-menu lunch from the excellent Old Bakehouse Restaurant, directly opposite our new shop in Miltown Malbay. I started sewing when I was nine years old and have been dressmaking ever since – that’s more than 40 years’ experience, including 3 years with a top London designer! I was fortunate to have such good teachers when I was young and have made it my mission to encourage as many people as possible to make, alter, and repair their own clothes. “… I learned more about sewing in two days than I did the whole year I spent in college. Thank you so much, it has given me the confidence to sew again. “ (BK, Ennis). This class is aimed at the complete beginner with no (or very little) previous experience, who wants to learn to make their own clothes. You’ll learn to use a sewing machine by making a colourful tote bag, before starting your first dressmaking project making a garment from a commercial pattern. Recognising that many men would like to learn to use a sewing machine, I’m delighted to offer a dedicated, 4-hour, class to be run over two Thursday evenings. You’ll be making up a popular backpack pattern in contrast fabrics – pre-tested by my non-sewing husband! The perfect course if you have a little experience using a sewing machine but want to start making (or altering) clothes. You will learn useful dressmaking techniques from pattern layout to finished garment, that you can apply to any project. You will make a sample pair of trousers in calico fabric. These workshops are suitable for those who have already completed a beginners’ dressmaking course or those who may be self-taught and have equivalent experience. The courses are fast-paced, and participants will need accurate machine-sewing skills. To get most out of the day, you should bring your own sewing machine or overlocker. Thread your machine with confidence and learn how to adjust the settings to create professional finishes. Then practice your skills using an overlocker to make simple t-shirt. Practice advanced dressmaking skills that will give your future dressmaking projects a bit of professional polish. You’ll make up a small sample jacket pattern that includes testing features, such as custom pockets, and tailored lapels and collars. If you’ve been thinking of buying a sewing machine, why not come to one of my monthly demo sessions and try my range of Husqvarna machines. The demo sessions run the first Wednesday of each month, from 10am to 12 noon, during which time all the sewing machines will be set up and ready to sew, with no obligation to buy. Don’t relegate that favourite outfit to the back of the cupboard for want of a button or a hem! Why not learn a to fix it yourself? Bring your small repairs and alterations to one of my ‘Repair Cafés’, from 10am to 1pm on the last Wednesday of each month, and learn simple techniques in a convivial atmosphere. I can’t promise to turn you into an ace seamstress in half an hour, but you might be surprised at what you can achieve with a bit of help. Exclusively for the Easter Holidays, I’m presenting two fun sewing classes for children. The first class, 2 x 2hr sessions, 10am – 12 noon,16th & 17th April, is aimed at younger children (age 7+) and will involve an easy, pre-prepared sewing project and some machine sewing. 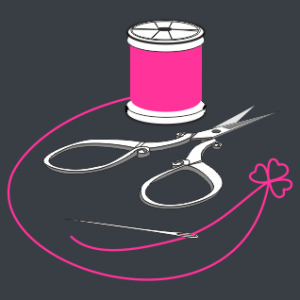 The second class, 2 days, 10am – 3pm, 24th & 25th April, is aimed at older children (11+) and is intended as an introduction to dressmaking, making a simple garment using a sewing machine. Please contact me direct using the form or call me on 087 669 3331 for more information.